After we have found and thoroughly checked our new best friend Kolya it is time to make some final preparations for our journey which will start on May 5th. First we assembled our new home on the roof of the car. The Maggiolina bed is very comfy and big so we needed some help from our friend Johannes when putting it on the car. Thanks Jogi for that! While the boys were assembling the bed, Jana had time to play around with the camera. Now we fixed the logos of our partners Paneurasia and the German-Russian Forum on the car. Also some self-marketing needs to be done as well. 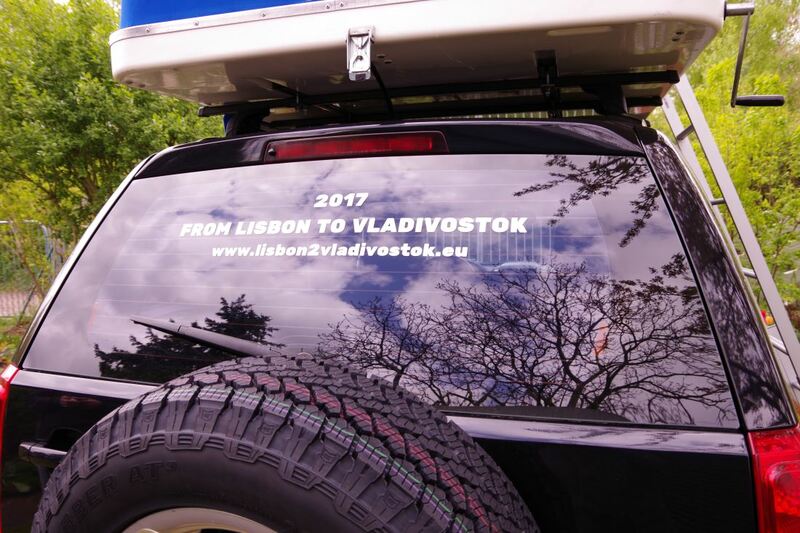 What a coincidence that the name of the travel company is exactly describing our route: From Lisbon to Vladivostok. Of course we place them on the front of the car. Now everybody on the road can check out our blog. We also pimped the back of the car a bit so that we can fit all our equipment inside. The wooden box offers some extra storage and we can put stuff on top of it which gives us extra space. So now Kolya is ready for the big adventure. We can’t wait to start our journey!